The 1970’s ARP Quadra synthesiser was used on countless disco records, funk, John Carpenter soundtracks, Genesis albums, soul, New Order records, Gary Numan’s Micro Music tour, Joe Zawinul. Jean Michel Jarre made great use of it. The list is almost endless. This instrument can easily give you all the great sounds of this classic and much sought after synthesizer at a fraction of the original price, with a huge amount of extra features, allowing the creation of sounds that go far beyond what the original hardware Quadra is capable of. Sample Magic “Quadra” is based on the classic 1978 ARP Quadra synthesiser and is fully programmable from the front panel which replicates the actual front panel of the original. The “Quadra Expansion Pack 1” is included in this product. This instrument can easily give you all the great sounds of this classic and much sought after synthesizer. 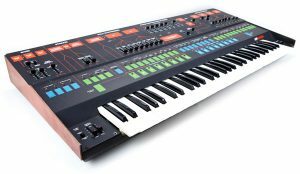 Also featuring an extensive effects section, plus extra features such as a 16-step, analogue-style sequencer, allowing the creation of sounds that go far beyond what the original hardware Quadra is capable of. This is a versatile synthesizer that will fit into any style of music! As used on John Carpenter soundtracks, Genesis albums and many others! A Brief History of a Classic late 70’s Synth – The ARP Quadra! The ARP Quadra was a 61 key analog musical synthesizer produced by ARP Instruments, Inc. from 1978 to 1981. The machine was a four section synthesiser that combined pre-existing products, including the Omni, Odyssey and Solina and consisted of a bass-synth (monophonic), poly-synth (full polyphonic), lead-synth (duophonic), and Solina like analog strings (full polyphonic). The top three octaves of the keyboard have a mechanical touch sensor that can either pitch bend or impact brilliance and filter. Unique is the flat pedal feature which allows pedaling to dip individual notes and chords a semitone below so they rise to pitch with the envelope’s attack. The Quadra used the typical ARP orange and black color scheme of the company’s later years including the orange leather end pieces and the clean XLR out for DI console recording. This is a classic late 70’s synth that was used by: Genesis, Pink Floyd, New Order, Joe Zawinul and John Carpenter… and many more. This instrument can easily give you all the great sounds of this classic and much sought after synthesizer. 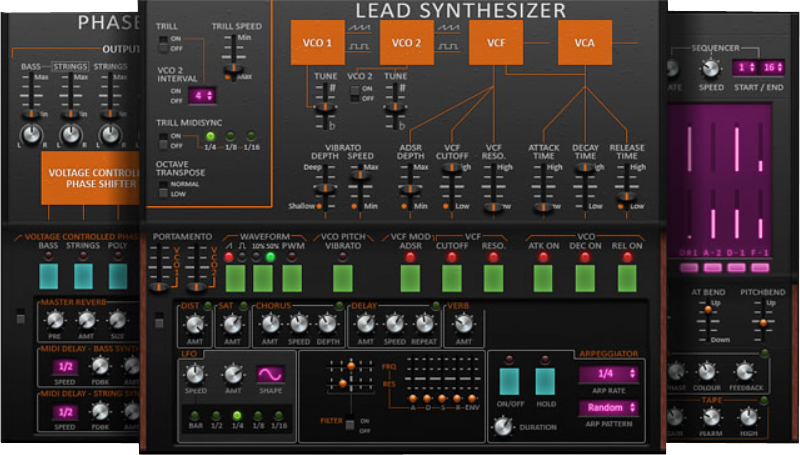 It also features an extensive effects section, plus extra features such as a 16-step, analogue-style sequencer, allowing the creation of sounds that go far beyond what the original hardware Quadra is capable of. The graphical user interface (GUI) recreates each control of a real Quadra, and is just one more attention to detail that enables you to experience this beautiful, vintage synthesiser, without the need to own the real machine. All the sliders and envelopes have been calibrated and timed to behave like a real Quadra and there are lots of great extra features that really bring the Quadra synthesiser into the modern studio environment. All samples streamed from disk to ensure quick load times and small memory usage. Lead section now contains all of the available oscillator waveforms of a real Quadra. Preset system which is a collection of sounds made on a real Quadra and then sampled and placed under A dedicated preset system with sequencer and arpeggiator. Each section of the Quadra (bass, strings, poly and lead can be loaded independently so you can make your own Quadra configurations, each with its own arpeggiator and sequencer. Each section now has its own dedicated effects section and extra features. Easier to use sequencer with added features. Midi syncable LFO’s and Delays. Normally €111.99 – get it at 55% before its gone! Absolute no-brainer at 55% off the normal price (normally €111.99)! Over 500 quality presets including 100 MULTIs comprising the raw waveforms of a real ARP Quadra: Bass, Bass Strings, Strings, Poy and lead synths. All samples streamed from disk to ensure quick load times and small memory usage. Lead section now contains all of the available oscillator waveforms of a real Quadra. Each section has its own dedicated effects section and extra features. Many, many more extra features. Perfect for Funk, Disco, Electronic Pop, Ambient, Soundtracks and much, much more!